The UN Commission on Life-Saving Commodities was tasked to answer two basic questions: which medicines and health supplies can quickly make a difference in the health of women and children? And how can we make sure women and children access these? In answer to the first question, the UN Commission singled out 13 underused, life-saving commodities for reproductive, maternal, newborn and child health (RMNCH) back in 2012, that, if more available and better used, could save millions of women and children. To address the second question, the UN Commission made ten recommendations to change how these overlooked commodities were made available, distributed and used. 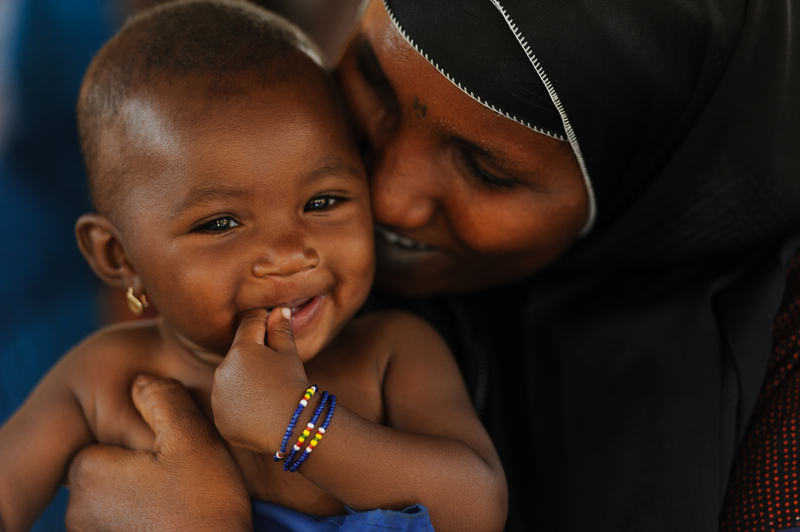 Between 2013 and 2015, 19 countries in sub-Saharan Africa and Asia, supported by grants from the RMNCH Fund, have implemented RMNCH plans to make the UN Commission’s recommendations a reality, aiming to make life-saving commodities more available and more effectively used. At the same time, 450 global experts, spanning 83 organizations joined forces. They gathered market intelligence, supported innovative products, developed tools for health workers, and crafted demand generation and advocacy strategies to support these countries in implementing their RMNCH plans. Across countries, and nearly for all commodities, supply chains are a weak link in making essential commodities available. It could be chronic stock outs in the central medical store, or a lack of trained health workers to administer the medicines, or difficulties in reaching the last mile. The Interagency Supply Chain Group (ISG) was established in 2014 alongside the UN Commission to improve the efficiency and effectiveness of in-country supply chains. The group promotes coordination both globally and locally through national leadership. It brings together 15 major actors involved in providing supply chain support to countries and will be facilitated by the World Health Organisation, from 2017. The RMNCH experts at global, regional and national levels involved with the UN Commission’s work have accrued in-depth expertise of what prevents essential commodities from reaching women and children, and how to remove these barriers. What started as a loose coalition to implement the UN Commission’s recommendations is now a valuable knowledge partnership. The true experts are local! 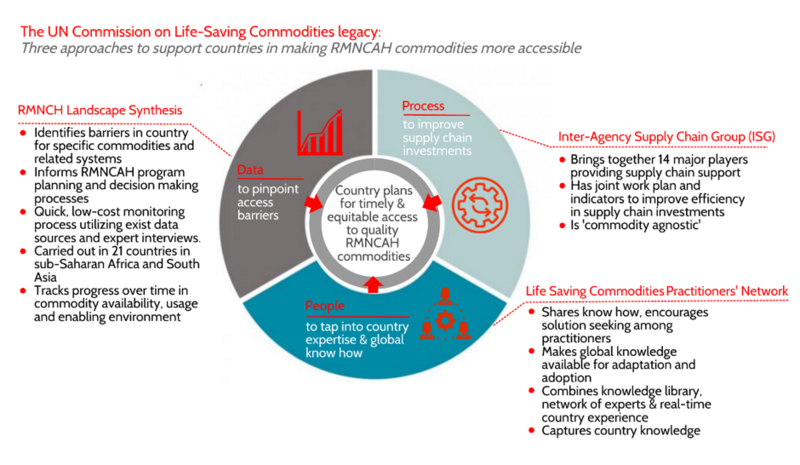 We set up the Life-Saving Commodities Practitioners’ Network to translate the learning and know-how that global experts have developed into country-level action, and importantly, capture country and regional experience and knowledge on how to increase access to life-saving commodities. The World Health Organisation will take the lead in facilitating the Network communication from 2017, where it will feed into the newly established Network to Improve Quality of Care for Mothers, Newborns and Children. The RMNCH commodities availability and use give an insight into the effectiveness of the health systems to deliver services. By applying a commodity lens, the RMNCH Commodities Landscape Synthesis collates existing information from community, facility and national level sources and complements them with expert interviews to help identify what really prevents women and children from accessing the life-saving commodities they need. By the end of 2016, the RMNCH Landscape Synthesis had been carried out in 21 countries in sub-Sahara Africa and Southeast Asia. In country, the results have been used to develop annual plans, draft grant proposals or formulate GFF investment cases. The tool is part of the evidence gathering processes used to inform national RMNCAH reviews, plans and strategies. Together, these three approaches centered on people, processes and data work to remove barriers to accessing essential commodities. This follow-up to the Commission’s recommendations is undertaken under the Every Woman Every Child banner, where together with other RMNCH initiatives, it contributes to meet the goals of the Every Woman Every Child Global Strategy for Women’s, Children’s and Adolescents’ Health. Bill and Melinda Gates Foundation, DFID, Global Affairs Canada, the Global Drug Facility, KfW, the Global Fund, Gavi, NORAD, UNDP, UNFPA, UNICEF, USAID, World Bank, the World Food Programme and the World Health Organisation.